Second episode of Carter's Column goes live today at the Birmingham Post. 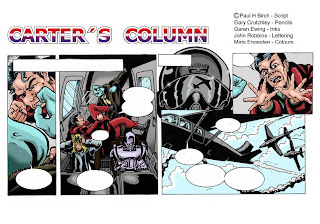 Once again I uploaded the coloured artwork above but, if'n you all want to know what they're all saying, then your gonna have to nip over to the web address above. If you want more info on it, then just read the previous post where I rattled on about it fer ages. Thanks Dave. Yup looks like I'm gonna be chained to the drawing board fer a looong time. nice to see it escape from the cupboard. It might even get finished. They planned to run all year Dave, and the best part is I've mostly finished my bit, so I can sit back and relax a little. Cheers Archavist, appreciate that you've popped over and had a look.